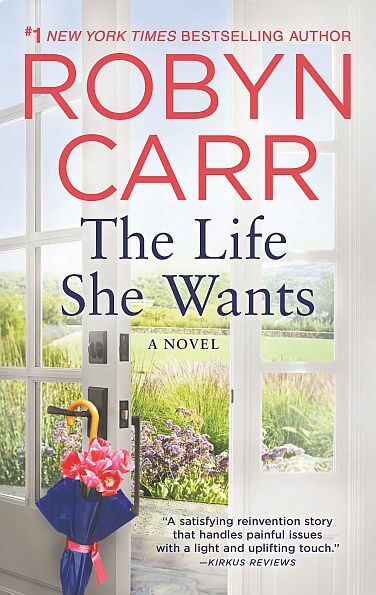 #1 New York Times bestselling author Robyn Carr creates an uplifting ensemble of characters in this rags-to-riches-to-rags novel about women, friendship and the complex path to happiness. In the aftermath of her husband’s crimes, Emma Compton’s world is shattered. Richard Compton stole his clients’ life savings to fund a lavish life in New York City and, although she was never involved in the business, Emma bears the burden of the fraud. Only one friend stands by her, a friend she’s known since high school, who encourages her to come home. But starting over isn’t easy, and Sonoma County is full of unhappy memories, too. And people she’d rather not face, especially Riley Kerrigan. Riley and Emma were like sisters—until Riley betrayed Emma. Emma left town, planning to never look back. 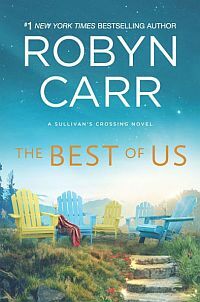 Now, trying to stand on her own two feet, she can’t escape her husband’s reputation and is forced to turn to the last person she thought she’d ever ask for help—Riley. It’s an uneasy reunion as both women face the mistakes they’ve made over the years. But if they find a way to forgive each other—and themselves—each of them can find the life she wants. Originally published October 2016 in trade paperback and eBook. There was a time when the truth became brutally evident, and it was such a minor moment it might have escaped her. Emma Shay Compton had always known that her marriage to Richard looked like a fairytale to many and though she had loved Richard, she had always felt something lacking. She couldn’t put her finger on it, it was so vague. Richard was good to her, generous, though he was a busy, busy man, and soon after their wedding he became remote. Distant. Mega-rich brokers don’t sit around the house coddling their young wives, they work sixteen hour days. They’re never far from their phone. They seem to command multitudes. And if a person, even a wife, wanted to get on his calendar, she had to plan ahead. So when she’d get that feeling that something was wrong with her marriage, she’d sometimes blame herself. She should be more understanding. She didn’t give it another thought, though she did pay attention as he suggested. Of course he was right—there were many investigations, steep fines, reorganizations, buy-outs, companies shutting down. The banking and investment world was under very close scrutiny. He’d cut himself shaving and swore, and she met her own eyes in the mirror. That was the instant she knew—she’d been living a lie, and everything said about him was true. He was a cold, calculating liar and thief. And her life was about to change forever. It’s the little things that will break you. Emma Catherine Shay had been thinking about that a lot lately. She stood strong while everything was taken from her, while she hid out at a little motel near the Jersey shore, while her husband was buried, while the media spun a sordid tale of deceit and thievery that implied she’d been aware if not complicit in what her late husband had done. Stood. Strong. But when the heel broke on her best sling back pumps leaving her stumbling down the courthouse steps, she collapsed in tears, a photo printed everywhere, even People magazine. When they asked her to please stop coming to her yoga studio, she thought she would die of shame and cried herself to sleep. No one had ever explained to her that the last straw usually weighed almost nothing. Everything in her Manhattan apartment and vacation home had been auctioned. She packed up some practical items to take with her and donated some of her more personal clothing to women’s shelters. Of course the art, crystal, china, silver and jewelry had disappeared quickly, even items she could prove had nothing to do with Richard’s business, even wedding gifts from friends. They took her designer clothing. Her Vera Wang wedding gown was gone. She kept a couple sets of good sheets, towels, one partial set of kitchen ware, six glasses, a few placemats, napkins and so on. She had a box of photos, most from before Richard. She stuffed it all in her new Prius. The Jag was gone, of course. There had been a settlement since they couldn’t establish that she had anything to do with Richard’s Ponzi scheme; couldn’t prove it since she hadn’t. She hadn’t testified against him, not out of loyalty or because it was her legal prerogative, but rather because she had nothing to say, nothing upon which to leverage some kind of deal. She hadn’t been in court everyday out of support for Richard but because it was the best way for her to learn about the crimes he was accused of. She had come into the marriage with nine thousand dollars in savings; she left as a widow, keeping nine thousand in a checking account. It would be her emergency fund. She started a trip cross country, leaving New York behind and heading for Sonoma County, where she grew up. She’d given all this a great deal of thought. She’d been thinking about it for months before Richard’s death. She could’ve kept the entire settlement and retired to the islands. Or maybe Europe. She’d been fond of Switzerland. She could change her name, color her hair blond, lie about her past … But eventually people would figure her out and then what? Run again? Instead, she surrendered the settlement, gave up everything she could have kept, and headed home to face it. She didn’t want Richard’s ill-gotten gains. Even though she hadn’t swindled anyone, she couldn’t in conscience touch any of it. “Rosemary, I didn’t do anything,” she reminded her. Well, Rosemary had always thought the worst of her. She hoped the people she knew in Sonoma County wouldn’t. She’d lived there her whole life, gone to Catholic school and public high school there. And she thought it was extremely unlikely any of Richard’s clients, aka victims, of his New York-based investment company hailed from the little towns in Sonoma County. Her closest friend, possibly her only friend at this point, Lyle Dressler, found her a little furnished bungalow in Sebastopol. Lyle and his partner lived in the town so she had some moral support there. Emma was thirty-four and had married Richard Compton, twenty years her senior, nine years ago. He was a sharp, handsome, successful forty-five when they married. She’d been twenty-five and completely under his spell. Forty-five might have been twenty years older than she, but it was hardly considered old. He was fit, healthy, brilliant, rich and still young. In fact, he was considered one of the most desired bachelors in New York City. Rosemary and her sisters had certainly liked him then. They were eager to travel to New York to attend any social event Richard would grudgingly include them in. But they hadn’t offered one ounce of support to Emma during the take-down. The few years of marriage before the investigation and indictment hadn’t been heaven on earth, but it was all right. Her complaints seemed to be standard among people she knew—he was busy, preoccupied, they didn’t spend enough time together even when they were traveling. The first friends she’d made through work in New York had gradually drifted away once she settled into her multi-million dollar marriage. She’d never quite fit in with that elite crowd, so she’d been a little lonely. It seemed like she was always around people, however, doing her part with committee work, exercising, decorating, entertaining, feeling that she must be indispensable to Richard, he was all she really had. It was a dark and terrible day when she realized he was a complete stranger. Before her fifth anniversary, the investigation had begun. Before the seventh, indictments had been handed down and assets frozen. She spent her eighth anniversary in court. Richard’s defense attorneys had managed many a delay, but eventually there was a trial—a circus of a trial—and she appeared to be the trusting, good wife, head held high. Richard’s mother and sister had not come to the trial and refused interviews. She’d always assumed they didn’t think she was good enough for Richard, but after the trial she changed her opinion. They must have known all about him. He had to be dark and empty inside. He never talked to her about it, at least not until the ugly, bitter end. Not one conversation. When she asked about the investigation, he just said they were out to get him, that business was tough but he was tougher, that they’d never prove anything. At the end there had been a few brief, nasty but revealing discourses. How could you? How could I not? How could you justify the greed? My greed? How about their greed? Do they have to justify it? They wanted me to do anything to make them money! They wanted me to spin straw into gold even if I had to lie, cheat and steal! Each one of them just wanted their pay day before it all broke! The Feds proved everything with ease. Employees cut deals and testified against him. Truckloads of documentation proved securities fraud, theft, mail fraud, wire fraud, money laundering … the list was long. When the end was near, when he’d attempted a getaway and been unceremoniously returned by U.S. marshals, when his off-shore accounts had been located and identified, when he faced a long jail sentence with no nest egg left hidden away, Richard shot himself. Of course no one believed she had no idea. Apparently people thought he came home from the office and bared his soul over a drink. He had not. The Richard she knew was obviously a con man, a chameleon. He could be so charming, so devoted. But he always had a plan and always wanted something more. Why wouldn’t I marry you? You were an outstanding investment. Perfect for the role! It’s a well-known fact—people trust married men more than single men. He was a narcissist, a manipulator, a liar and cheat. He was so damn good at it, a person could feel almost honored to be manipulated and lied to by him. He had the looks of Richard Gere, the brilliance of Steve Jobs, the ethics of Bernie Madoff. Thank God he wasn’t as successful as Bernie. Richard had only managed to steal about a hundred million. What did she know? She knew he was private; he didn’t talk about work, which she thought was normal behavior for a powerful man. He was an amazing communicator in business and socially, but once he stopped courting her, he stopped telling her stories about his family, his youth, college, about his early years on Wall Street. She knew he didn’t have many old friends, just a lot of business contacts. She never met college pals or colleagues from his early professional days. He did routinely ask her about her day, however. He’d ask her about her schedule, her projects, what she did, who she talked to, what was happening in her world. When he was home, that is—he was often working late or traveling. The thing that set Richard apart from other, mediocre con men—he knew how to listen. People, herself included, thought they’d learned something about him when he hadn’t said a word about himself. But he listened to them. Raptly. They were thrilled by this attention. One nine-year marriage, a few years of which had been weirdly adequate, five years of which had been a nightmare. Now she wondered how long would the nightmare last. Emma went to Lyle’s flower shop, Hello, Gorgeous, named for Barbra Streisand, of course. Lyle had been wonderful to her through this whole ordeal. He hadn’t been able to be in New York with her very often. Not only was it a great, costly distance, but there was the small complication that his partner, Ethan, had never been particularly fond of Emma. He had made a couple of trips, however, and called almost daily during the rough patches. She understood about Ethan. But Lyle and Emma had been friends long before Ethan came into his life. For reasons unknown, Ethan had never warmed to her. Emma suspected good old-fashioned jealousy, as if Emma might bring out Lyle’s straight side or something. So, Emma and Ethan had always had a rather cool regard for each other. But since Richard’s debacle Ethan’s regard had gone from cool to cautiously frigid. But, and this was an important but, if Ethan went on about his dislike and disapproval of Emma too much, he was going to lose Lyle, and he might be bitchy but he wasn’t stupid. And, of course, who should be dusting up behind the counter but Ethan. “Well, Emma, I see you made it,” he said as though it took effort to be kind. “Yes, thank you,” she answered carefully. “Long journey?” Ethan surprised her by asking. “In every way,” she said. Then, hand on her elbow, Lyle escorted her out of the shop. “I’m parked right here. I’ll drive you down to your car,” he said. “Have you heard from Rosemary?” he asked. “Your sisters should be helping you now,” he said. They had never done anything to help her. “We’ve never been that kind of family,” she said. Indeed, they weren’t family at all. “I can relate,” Lyle said. “And she knows everything?” Emma asked.